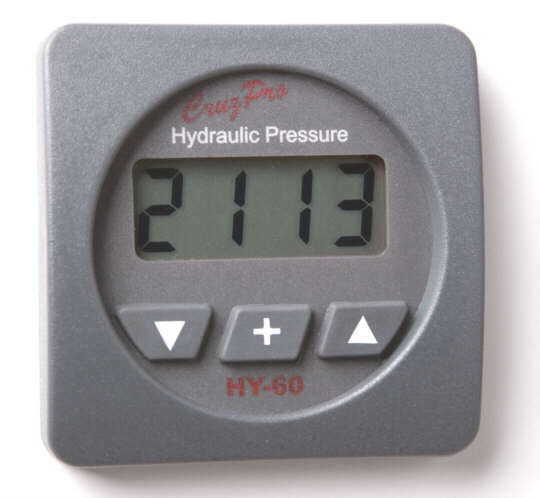 The HY60 is a digital gauge that works with 4-20mA hydraulic pressure senders and displays hydraulic pressure on a 4 digit LCD display. 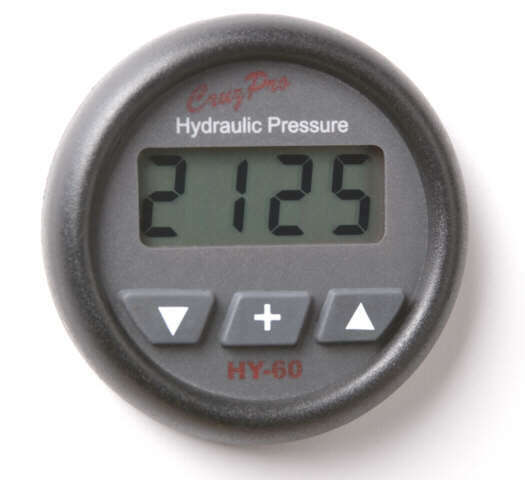 The HY60 Hydraulic Pressure Gauge displays pressure in Psi or Bars. It has built-in calibration curves for most popular 4-20 mA hydraulic pressure senders manufactured by Ashcroft, Omega, Midas, Gems, and others (sender not provided). 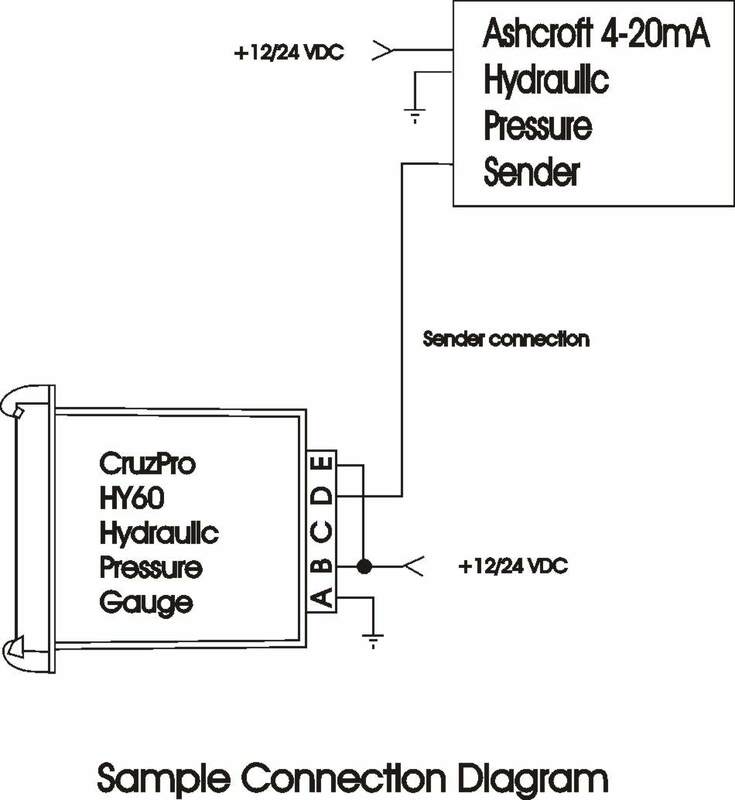 The sender maximum pressure is easily selected from 30 psi to 10,000 psi in 16 steps with the front panel keys. Low and High pressure alarms can be set over the entire range of the instrument/sender. When activated, the HY60 built-in 85 dB alarm will sound and the display will flash. The alarms can be enabled or disabled with a single key press. Five levels of backlighting can be selected and all setup, calibrations constants, alarm values, and sender data are saved to nonvolatile memory. The HY60 outputs NMEA 0183 compatible serial data on a screw terminal at the rear of the instrument. This ASCII information can be used to log performance or repeat the display information at a remote location on the CruzPro RP30 and/or RP110 data repeaters (see www.cruzpro.com/rp30.html and www.cruzpro.com/rp110.html). If NMEA 0183 serial data is not required, then the output terminal can be programmed as an external alarm output pin. With a press of the button you can view hydraulic pressure up to 10000 psi in 16 ranges. The HY60 draws only 0.017 amps, works on both 12V and 24V system and 5 levels of backlight (including OFF) can be selected from the front panel.